//When The Pains of Being Pure at Heart reached out to us about a potential music video we were immediately excited about the prospect of working with them. Once they told us about their love for Jem and the Holograms we were even more thrilled to get started. 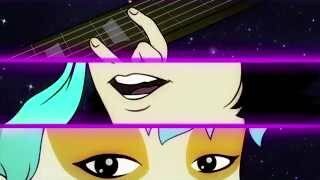 Lead singer/guitar player Kip Berman has had a fondness for Jem--both in message and aesthetic--since he was a kid and wanted to bring a similar vibe to their music video for "Until the Sun Explodes." We loved the idea as much as they did and were able to deliver an 80s glam rock version of the band for the video which launched alongside their brand new album "Days of Abandon." Powerhouse Animation’s post department did a lot of great work on this piece coming up with 80s-style effects to give the video a bit of an authentic vintage cartoon feel. The combination of lens flares and heavy filters gives it a distinct treatment and really contributes to the overall nostalgia of the video. Powerhouse also did the initial character designs for the video, providing the band with a few different options to choose from for their cartoon counterparts.